Creating an in-house solution appears on the surface as easy way to jump over the middle man and save money. But when you delve into the actualities of the cost, time and reliability outsourcing proves to be a better more practical answer. 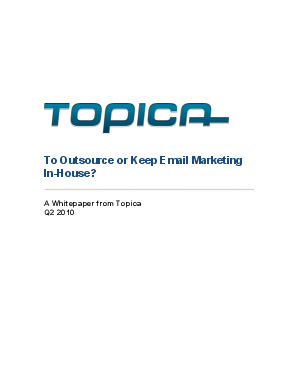 The only practical scenario for an in-house solution to successfully work would be if your company has preexisting resources, an army of developers and an IT infrastructure to deal with all the complexities attributed to mass emailing. For the majority companies small or big an outsourced system is the easiest and most effective way to save cost and time and to gain the reliability necessary to run a successful campaign. For a more comprehensive explanation you can download this whitepaper.